Parkrose Hardware and Historic Parkrose! BUY EARLY BIRD DISCOUNTED TICKETS NOW! BANDS APPLY TO PLAY HERE! – Food Tasting Pavilion featuring the Big Green Egg grills cooking up dozens of different bites. The Taste of Parkrose gorgeous, mountain view 5k run route will take runners from Rossi Farms through Luuwit View Park and then back to the Taste of Parkrose for a day of fun! Runners and Walkers welcome – all finishers will receive a raffle ticket for a chance to win beer growler donated by Gateway Brewing and other great prizes. 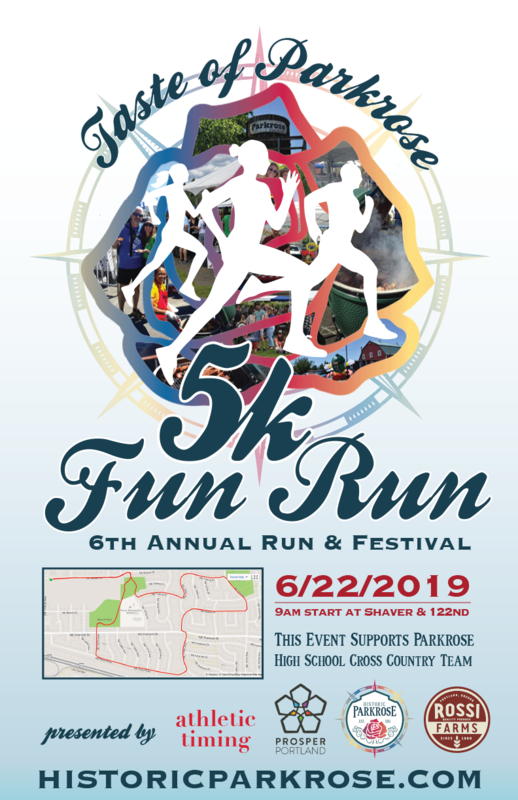 *** Proceeds from the Taste of Parkrose 5K will benefit the Parkrose High School Cross Country Team and Historic Parkrose. We had over 3,000 attendees in 2018 and plan on a bigger crowd this year! Get your business in front of locals and connect with the community. CONTACT US TO GET IN ON THE FUN! CHECK OUT LAST YEAR’S TASTE BELOW!